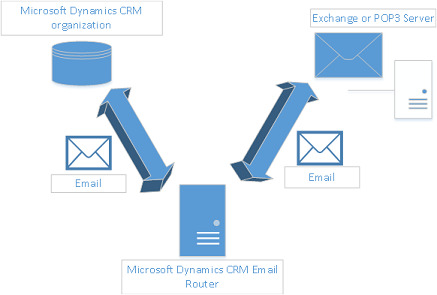 The Microsoft Dynamics CRM Email Router acts as an intermediary application that provides server-to-server synchronization between Microsoft Dynamics CRM and Exchange or POP3/SMTP based email servers. The Email Router only synchronizes email messages. It doesn’t synchronize appointments, contacts, or tasks. Although it is supported, we do not recommend that you install the Email Router on a computer that is running Microsoft Exchange Server. One or more incoming profiles. An incoming profile contains the information about the email systems that will be used to process incoming email messages. One or more outgoing profiles. An outgoing profile contains the information about the email systems that will be used to process outgoing email messages. One or more deployments. The Deployments area contains information about the Microsoft Dynamics CRM deployment and maps to an incoming and outgoing profile. Users, queues, and forward mailboxes. This area contains information about each user that will use the Email Router for email tracking. You can also configure email routing for queues and define a forward mailbox.